Since the holidays are upon us, I find that cookies are the best thing to package up and give to friends in family. Who doesn’t love a delicious sugar cookie? I have a few cookies that are my favorites to bake this time of year. My requirement for a good cookie recipe is that they are delicious, easy and that they are consistently the same every time I bake them. I feel this cookie holds up to those three requirements. Don’t you find it interesting how we find recipes? This one has a funny story behind it. My dear neighbor and friend, Rochelle kindly gave me this recipe. She obtained it from her mom, Janine (nice name) who got it from another woman that had brought it to an elementary class holiday party. I love how recipes are shared and cycled around. It is a cookie that isn’t too sweet and so a little mellower than most sugar cookies. I remember our childhood cookie jar had a frosted glass lid. Every time, you opened the cookie jar it made a pretty loud sound that my mother could hear from any room in the house. Since there were five kids in our family, she had to watch our cookie intake. My four brothers could instantly clean out the whole jar in just a couple minutes! I got pretty good at opening that jar without making a loud noise. Cream sugar, sifted powdered sugar, butter and shortening until fluffy. Add eggs and vanilla. Sift flour, baking soda, salt and cream of tartar. Mix in dough gradually. Shape and bake at 350 for 8-10 minutes. Miraculously, I was able to bake these yummy sugar cookies last week and give them to some of my neighbors. When I get focused on a project, I’m a woman on a mission. So for the last couple of days I’ve been baking and cookie dough is everywhere in my kitchen. Of course, my family is delighted with this mess since it means a ton of cookies to consume! 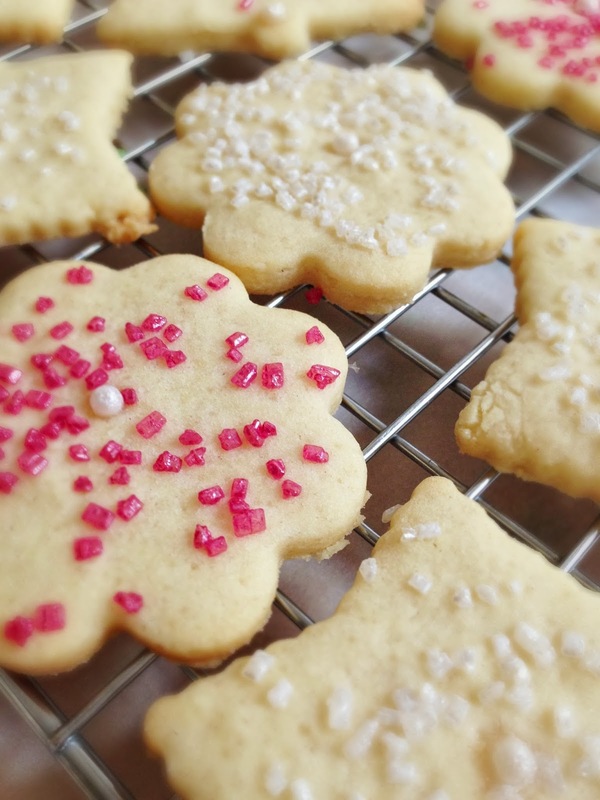 These sugar cookies are great fresh out of the oven, and they hold up well to freezing. If you make a few too many, store some in the freezer for a later date.